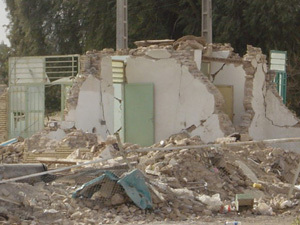 Two months after a devastating earthquake struck the southeastern city of Bam on 26 December 2003, killing more than 40,000 and leaving some 100,000 homeless, the majority of the survivors continue to live in tents, while the issue of long-term reconstruction remains unclear. "The majority of the people are still living in tents," Sudi Ahmadzadeh, a national transitional recovery coordinator for United Nations Development Programme (UNDP) in Bam, told IRIN, adding, that more than half of the survivors were living close to their former houses, while the others had already moved into organised camps. As of Thursday, there were 18 tented camps in Bam, all of them full to capacity and providing a wide range of services, she said, noting, however, that no additional tent camps had been planned, with the immediate concentration on intermediate shelter instead. And while efforts to establish semi permanent shelter camps were underway, the authorities had yet to decide how many people they would accommodate in them. "Some of the people are going to be in [semi permanent shelter] camps and some of them are not. They haven't yet decided how many of them [semi permanent camps] they are going to have," Ahmadzadeh maintained. The government had identified sites for building intermediate shelter in some other areas but basically it was still underway, with prefabs being erected and only a small number of people being able to move into them so far. However, there are some of the opinion that those people reluctant to move into camps and willing to stay close to their gardens and yards to do agriculture works, the main source of their income, might be provided with intermediate shelter, namely prefab houses, on their land. [Iran] A devastated home in Bam. As for the long-term reconstruction of the ancient city, the government hasn't announced its plans yet. "The plan and the complete strategy for the reconstruction of Bam has not come out yet," Ahmadzadeh said, adding that it could also take time for the approval and allocation of the necessary funds. The reconstruction is also exacerbated by the continuing presence of thousands of tons of rubble in the city. "The rubble is being removed very slowly and we don't see a major clean up," the UNDP official noted, adding that the debris were being dumped some 80 km away from the town. "This just needs a lot of machinery, which the government says they don't have enough to do this quickly, so there is still a lot of it in the town," she explained. A recent report by the UN Office for the Coordination of Humanitarian Affairs (OCHA) said there remained about 12 million mt of debris that needed to be removed and Tehran had already requested assistance from the international community for heavy duty machinery. 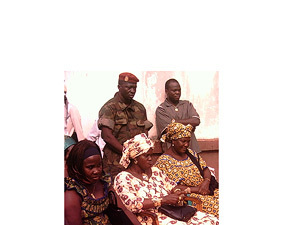 But in terms of reconstruction in rural areas, work had started. "Some NGOs involved in the reconstruction have signed contracts with the Government Housing Foundation, and have somehow started construction work, [while] some are in the process of planning," she noted. According to the UN, approximately 25,000 houses were destroyed in the city while another 24,000 homes were damaged or destroyed in the rural areas. Some reports say that the reconstruction of the city could take up to two years. "The town has to be rebuilt completely and this has to be done in the old shape," Horst Indorf, a representative for permanent shelter issues from ASB, a German NGO, and Danish People in Aid (DPA), told IRIN in Bam. But he remained weary over some construction techniques which had been used in the area before. "They are very keen on iron structures and you can see a lot of them in the city. This is not the right way to construct the city. Iron is moving during an earthquake. Most of the structures are secured only in one way and not in another way," he explained. Basic structures should be made from earthquake-resistant reinforced concrete with a solid foundation and this was easy to do, he maintained. "The most important thing is the structure of the building. It should be good [quality] material," he explained. Asked for the best alternative in terms of cost and locally available construction material given that Bam was in desert area, extremely hot in summer and cold at nights in winter, he said: "The best architecture for this area is clay brick but this means 80 to 90 cm thick walls and a very good insulated roof. That's very important," he said, adding, however, that it was also very important to secure clay walls with nets to make it earthquake-resistant. As for the roof, a very light weight insulated roof would be the best option, which in case of an earthquake wouldn't harm people even if it were to fall, Indorf explained. "People here also make very good material, which is a mixture of mud and grass, that can be used for insulation as well." He also emphasised the importance of a good surveillance system and training of people as most of the buildings destroyed by the 26 December quake hadn't complied with construction norms and standards. Meanwhile, the UN Human Settlements Programme UN-HABITAT is scheduled to launch a project to address the issue of earthquake resistant structures on 1 March in Bam. Within the project, technology for earthquake-resistant structures would be integrated through community consultation and training programmes in association with the UNDP, the Islamic Revolutionary Housing Foundation, and in partnership with the Bam Municipality. It is estimated that up to 140 families can be assisted through a pilot phase, which, if successful, would be extended to a larger community. The UN-HABITAT project is expected to last six months and cost US $400,000. And although the government's master plan to rebuild Bam has yet to be announced, experts hope that all issues will be considered to avoid any future complications or problems. "Hopefully the government and its institutions will learn [a lesson] from this and find methods to reconstruct the town in a proper way. Otherwise it will be a waste of money," Indorf warned.